Wandering through the streets of Downtown Manhattan, you will notice a property that is fit for those with a sophisticated palate. You have, A Thompson Hotel. 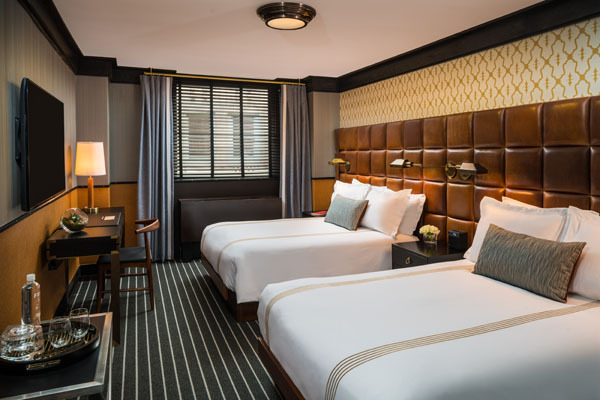 This recently renovated hotel is situated just steps from the bustling Seaport District, an area that is experiencing a fresh emergence alongside the neighborhood’s colonial-era streets of the past. 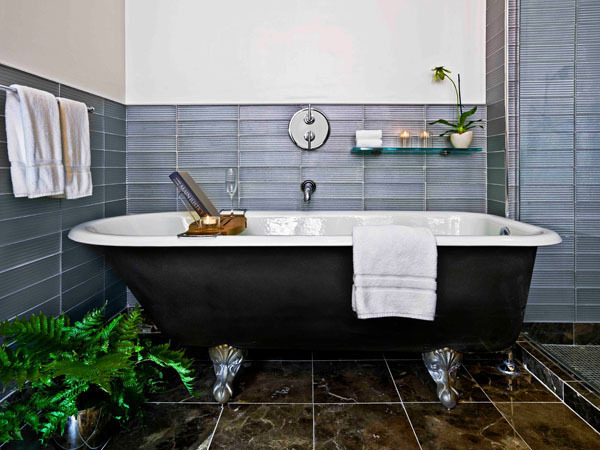 Designed by Bill Rooney Studio, an awardwinning New York-based interior design firm focusing on luxury hotels and high-end private residences, the 130 hotel guest rooms and suites provide a juxtaposition of understated, classic style and bold, modern elements. 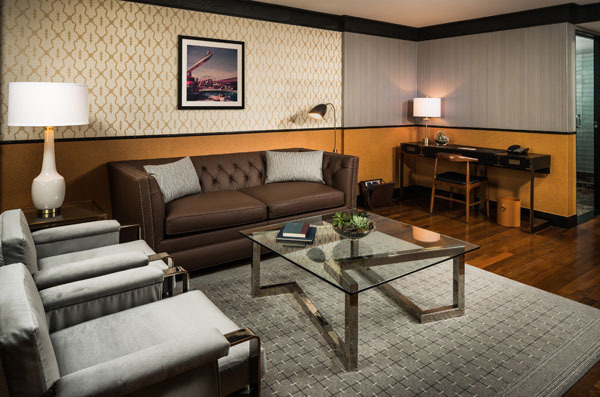 Rooms feature a mix of neutral, brown and taupe accents with custom 400-thread-count SFERRA linens and specialty beauty amenities provided by D.S. & Durga along with oversized terrycloth robes by Frette. Warm gray tones accompany a geometric accent wall adjacent to the bed’s oversized, tuftedleather headboard designed by Jim Walrod, who also designed the property’s public areas. With a border of camel accent colors at the wainscoting, elegant drapery accentuates the room’s pronounced height, providing scale to the large windows. Soft leather furniture and accessories, including a bespoke mid-century lounge seat and a tailor-made magazine rack adorn the space. Guest rooms feature an assortment of abstract photography by artists including New York-based Raj Mohan, who highlights beautiful subjects in unexpected places, Maryland artist Llewellyn Berry, who specializes in representational imagery, Venezuela-born Tony Vazquez-Figueroa, whose concentration is in both photography and mixed media, and renowned American photographer Slim Aarons. The rustic interior of Gild Hall is adorned with charming décor from vintage books in the library lounge to candlelit tables and leather banquettes in the adjacent Felice Ristorante, where guests gather at the expansive brass bar or enjoy Tuscaninspired dishes among dramatic chandeliers and authentic Italian photographs of 1960’s Rome. The intimate wine bar upstairs, La Soffitta, houses an extensive collection of Italian vintage wines and serves a range of innovative cocktails. 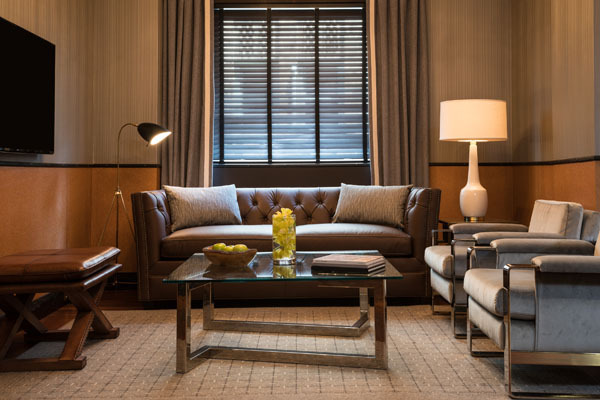 All guests at Gild Hall can enjoy in-room minibars stocked with gourmet snacks from New York City purveyors and have access to a complimentary 24-hour fitness center, business center, free Wi-Fi, in-room dining and daily turndown service. Effortlessly blending classical European sensibility with American contemporary style, Gild Hall serves as a modern-day club for the kings and queens of Wall Street. 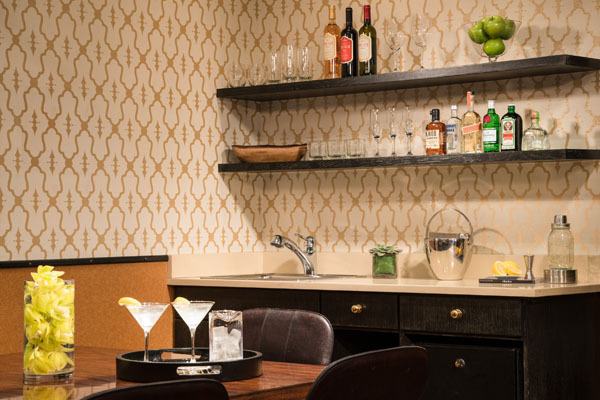 Located minutes from Battery Park, the Brooklyn Bridge and Seaport District, Gild Hall is ideally situated as a home base for any stay in Manhattan.